Details on the core True20 backgrounds, plus rules for playing orcs, hobgoblins, goblins, and the fiery azhar. Over a dozen paths for the three core roles including the cultist, the assassin, and pirate. Rules expansions for skills and feats, including new skills such as Knowledge (forbidden lore) and cool feats like Divine Domain, Dying Curse, and Bloodline. Guidelines for incorporating madness and corruption into your Freeport adventures. Expanded equipment tables including poisons, drugs, new weapons, and general gear, and a new pricing system for your True20 Fantasy games. Rules for rituals include several sample profane rituals including Awaken the Dead and Conjure Demon. 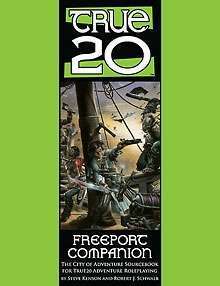 Statistics for over 75 key characters described in the Pirate's Guide to Freeport including heroic allies such as Buster Wallace and KÃ¢â‚¬â„¢Stallo and terrible villains like Red Alice, Prendag the High Death, and Kothar the Accursed. True adventure, true excitement... True20! This title was added to our catalog on August 14, 2007.